Magellanic Penguin is a South American species that can be found inhabiting the rocky islands off the coast of parts of South America. This species was named after the explorer Ferdinand Magellan. He was the first person to see them during a voyage in 1519. Unlike other species, these penguins reside in temperate and even tropical environments. They are excellent long distance swimmers. They can swim at a speed 25km per hour foraging for food in the open ocean. Their diet contains almost entirely of fish. 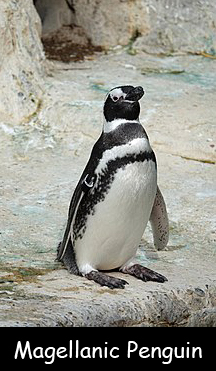 They are considered closely related to the Galapagos penguin, Humboldt penguin, and African penguin. Magellanic Penguins are social creatures as they prefer to live in flocks. They swallow a large amount of ocean water that contains a lot of salt. They excrete the excess salt through special glands near their eyes. Their natural predators are foxes, cats, rats as well as predatory birds. They have wings that they use like paddles. They have natural oil on their feathers which are densely packed on their bodies. On the base of the beak and above the eyes, they have a calloused pink area that helps them regulate their body temperature. They can stay submerged for about 180 seconds but usually do it for 2 minutes. Their breeding season starts from late September to early February. During this time, adults come to shore and establish nest sites with loose colonies. Declan, Tobin. " Magellanic Penguin Facts for Kids ." Easy Science for Kids, Apr 2019. Web. 23 Apr 2019. < https://easyscienceforkids.com/magellanic-penguin/ >.